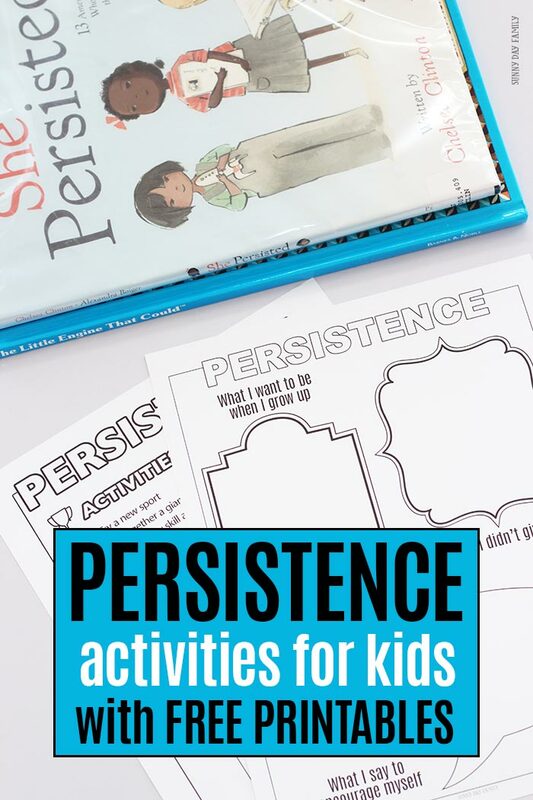 Persistence activities to help kids and families learn about the power of perserverance. Includes a free printable activity guide! "I think I can... I think I can... "
I was an anxious kid. Trying new things was never easy for me, and sometimes I wanted to give up before I'd even started. But when I began to doubt myself, my mom would remind me of The Little Engine That Could. The famous line from that story became my mantra, and it still is to this day (yes, I may have even used it when I was in labor with my twins). The little engine taught me my first lesson in persistence: when you keep going no matter how hard it may seem, until you reach your goal. This month, our Family Dinner Book Club is focused on persistence, and I have some fun ideas for you to help your kids learn to be just like little engines too. Family Dinner Book Club is a way for families to connect around a children's book, a great meal, and engaging activities and conversation. Along with my co-hosts, Jodie from Growing Book by Book and Sarah from Chef Sarah Elizabeth, we have everything you need to plan your total book club experience. Every month, we are highlighting a new character trait with a featured book. Then Jodie will give you more books to choose from around the theme, plus conversation starters. Sarah will give you a delicious themed dinner menu and table crafts. And I will give you activities and service projects to complement the theme and books. We also have a free printable planner to keep all your Family Dinner Book Club plans in one place. It includes the full theme and book list for the year plus planning pages for each month. Get yours by clicking the button below! 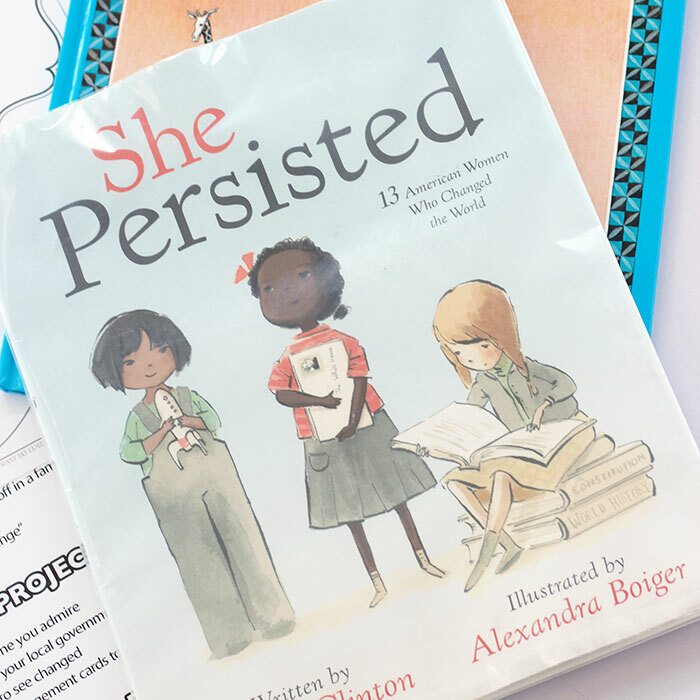 This month we are focused on persistence and our featured book is not the classic train tale that I grew up with, but a new children's book that I wish I would have had as a young girl: She Persisted by Chelsea Clinton. 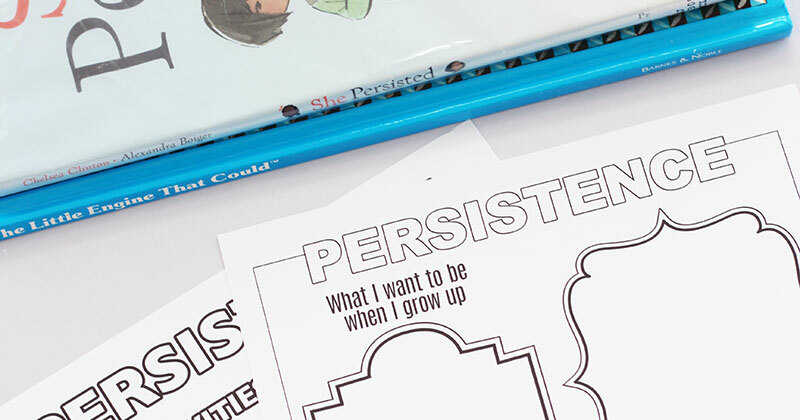 She Persisted is a must read for girls and boys to encourage them to follow their dreams. It tells the true stores of 13 American women who didn't let anything stand in the way of their dreams. As the book says, "They persisted and so should you." Here are some fun ways to practice persistence with your family this month. 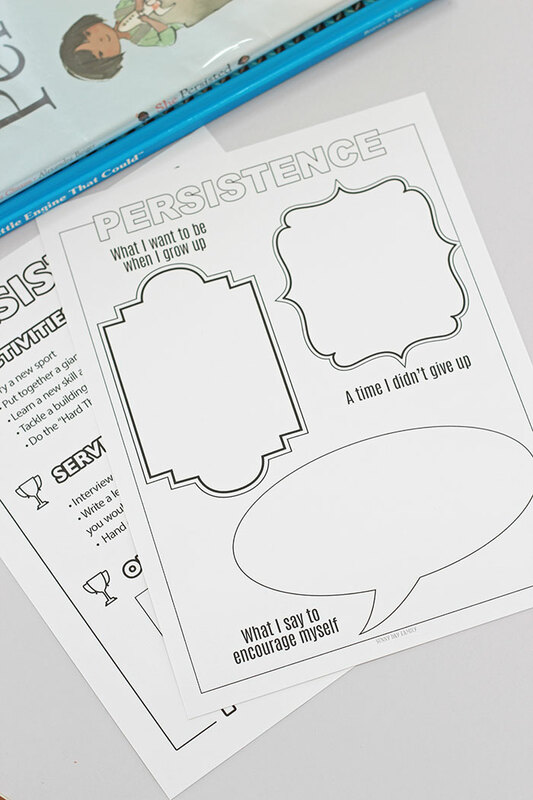 First, download my free printable Persistence Activity Set. This 2 page guide to this month's activities has everything you need to get started. On the first page you'll find drawing and writing prompts to get your kids started thinking about persistence. They'll find a place to draw what they want to be when they grow up, to reflect on a time when they didn't give up (though they may have wanted to), and a space to write their own mantra to encourage themselves through hard times. Try a new sport: go ice skating, bowling, or head to the batting cage to learn something new. Put together a giant puzzle. Find some fun ones below! Learn a new skill and show it off in a family talent show. Learn to juggle or master a magic trick! (PS - see how we turned a cardboard box into a magician's table here) . Tackle a building challenge. Put together a complicated LEGO set or learn to build a robot. Try the "Hard Thing Challenge." Read more about the Hard Thing Rule here and try it out with your family. Interview someone you admire. Talk to a grandparent, aunt, uncle, neighbor or friend and learn how they had to use persistence to achieve their goals. Write their story in our make your own book. Write a letter to make a change. Is there a change you would like to see in your community? Write a letter to your local government or town officials and use the power of persistence to do good. Encourage your friends. Use our kindness postcards to give to friends who are struggling with a new skill or project, and encourage them to never give up. Get your Persistence Activity Set by clicking the button below! Don't forget to head to Growing Book by Book for a Persistence themed book list and conversation starters, then to Chef Sarah Elizabeth for a themed dinner menu and tablescape with another awesome printable page. Then share your Family Dinner Book Club pictures with us on Facebook - we'd love to see them! So many awesome ideas to teach kids about persistence and determination.